Lately, I've been making Slow Bread. It's the bread I make when I've neglected my sourdough starter, but I want the deep flavor and chewy texture of a long, slow fermentation. The idea is simple: long, cold rising encourages flavorful lacto-fermentation, instead of astringent yeasty-flavored alcoholic fermentation. I positively detest the flavor of over-yeasted bread. Slow Bread is also very convenient for the work week. I can mix it up before bed, knead it down just before I leave for work the next morning, and shape it into loaves when I get home. 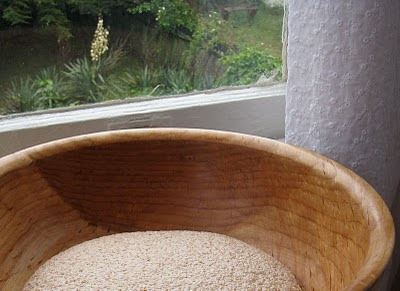 You can even let it go for a third rising in the bowl before shaping it -- so long as the weather's not too hot. About that weather. I've been wearing wool for a week and my hands are growing bony with the cold. The cats have cabin fever and quarrel over my lap. It's deathly still for a moment and we are so stuck, so trapped, so entombed in this wretched fog. It's only June, but my heart quails at the thought of another horrid mummified summer on this godforsaken peninsula. I suppose it's clear that my distaste for this weather is not unmixed with a certain macabre fascination. I like to take long walks among the shrouded eucalyptus trees, and I'm grateful when I don't have to see all the sunny-day people. But a macabre fascination in no way makes up for missing out on summer. And the summers I miss are not even golden breezy affairs, but sickly hot things spent working in the orchard with gnats up my nose and peach fuzz adhering to my sweat. Well, if you have that sort of summer, you should let this bread rise in the springhouse or down in your basement. The night before baking, put 1/8 to 1/4 tsp. yeast (depending on how cold it is) in a quarter-cup of lukewarm water. Stir 2 T. salt into another half-cup of water. Put twelve cups flour in a bowl. 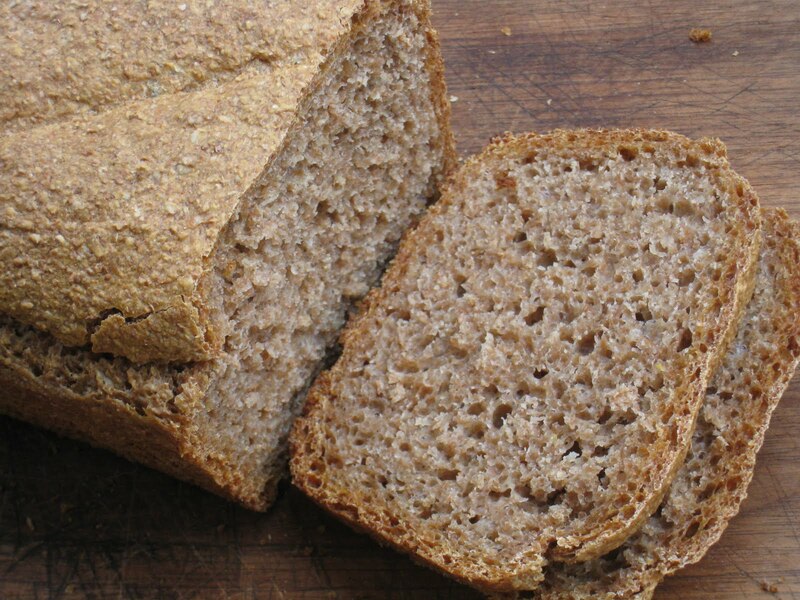 For all my bread these days, I use coarse, freshly ground spelt flour. When the yeast is dissolved, add it and the salt to the flour. Add a couple of cups of water, and stir well. 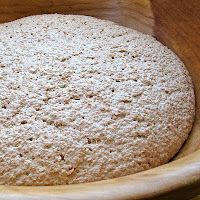 Keep adding water -- a bit at a time -- until all the flour is moistened. I would give you better measurements, but the amount of water you need will vary widely depending on your weather and the flour you've got. It should be soft but still bouncy. 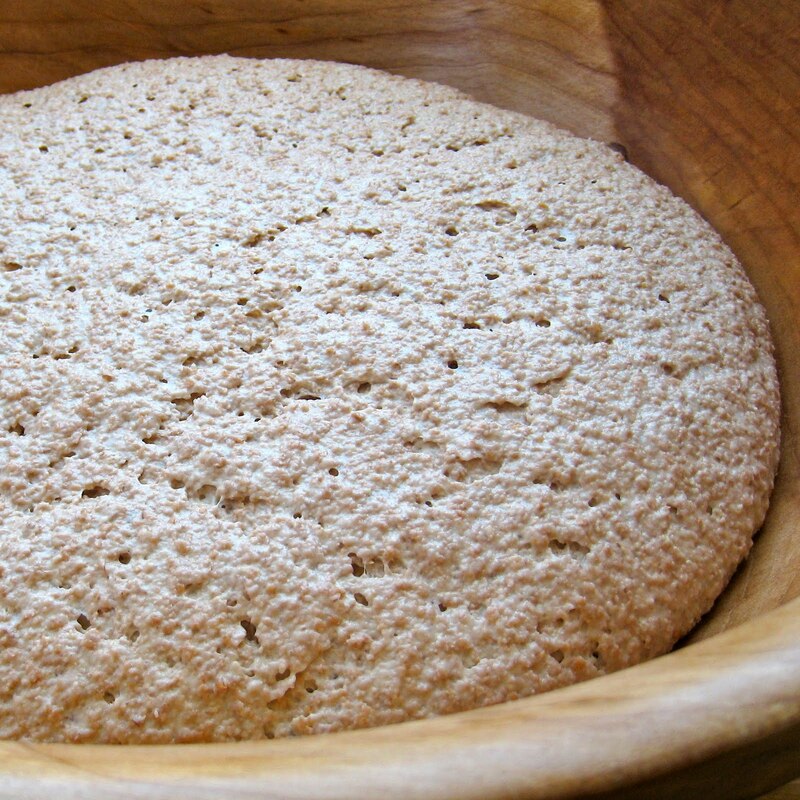 Knead the dough well, form it into a smooth ball, and place it in a large oiled bowl to rise in a cool place. Cover it with tea towels. In the morning, it should be risen and bubbly. Knead it gently back into a taut ball, and leave it to rise again, still in a cool place. When it has risen high and its top has started to look not taut, but puckered, you can either knead it down and let it rise once more in the bowl, or shape it into loaves. To shape the loaves, cut the dough in two. Shape each half into a taut ball, and let it rest in the bowl or a floured tabletop for ten minutes or so, to the give the gluten a chance to relax again. Oil a large baking sheet or two loaf pans. Take each ball of dough and tuck two opposite sides down and under, keeping the top of the loaf smooth and taut while letting it elongate. Place the shaped loaves in your pans or on the baking sheet and let them rise again. When they are not quite doubled in volume (not height), still taut and springy, preheat the oven to 450. Place the loaves in the oven and turn it down to 350. Bake until they are well browned and hollow-sounding when tapped on the bottom, about one hour. An innovative bread, and lovely, too. Quite a coincidence, I bought a loaf pan today. After two successive breads over fermented while rising and collapsed in the sudden heat. Leaving me craving for a slice of something square!